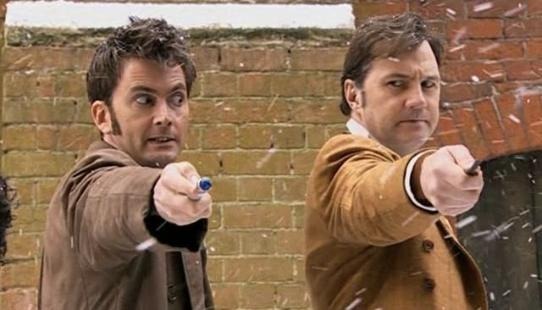 After the end of Series Four, both Russel T. Davies and David Tennant were leaving Doctor Who. I'm not entirely sure how much of a surprise this came to the production crew overall. I suspect this may have been a slight surprise or just involved a lack of planning/communication due to how 2009 was spent... I could be very wrong there and this was part of the plan overall. It's just that nothing else like this particular set of episodes has happened before or since really... though I honestly prefer this to having an entire year of nothing (Cough2016MoffatCough). The David Tennant Specials ran intermittently from 12/25/2008 till 1/1/2010 and included five episodes total. Also included in this grouping is the second animated special because that just seems like the best place to put it in all honesty. It was during this time that the Doctor had no companion at all. He would have helpers in every episode but no constant companion...though I would include Donna's Grandfather, Wilfred Mott as a companion. This season has "lovingly" been referred to as the David Tennant Dance of Death by many people. This is because every single special during this story mentions or insinuates that the Doctor is going to die/regenerate. While watching these over the course of the year might not have made it so obvious, watching them back to back made it seem like that simple fact was lording over all like some big villain we needed to be wary of and it got old REALLY fast. That's partially my issue with something that happens in Series 9 but I'll get to that later. 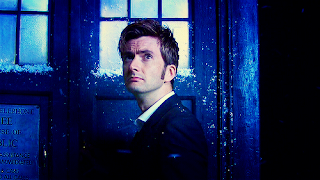 The Doctor lands in London on Christmas Eve in 1851 where he hears calls for help. However he meets a man calling himself "The Doctor" and his companion Rosita who are chasing a Cybershade, an animalistic version of Cybermen. The Doctor believes this man may be his future incarnation, the Next Doctor, having suffered amnesia from regeneration...though some things just seem off about him. The Next Doctor takes the Doctor to the house of a recently deceased man that the Next Doctor believes involved with recent missing people and the Cybershade. There they find and take Cyberman data-storage infostamps which the Next Doctor remembers using against the Cybermen the day he lost his memory. Two Cybermen attack but the Next Doctor destroys them by using the electrical discharge of the infostamp. The pair go to his home base with Rosita where he has been collecting information on the missing people and housing his TARDIS. To the Doctor's surprise, the TARDIS is a gas balloon. After looking around, the Doctor realizes that this man is not his future self but a human; the first man to go missing named Jackson Lake. He apparently became so distraught by his encounter with the Cybermen that his discharge of the infostamp embedded his own brain with knowledge of the Doctor. The Doctor and Rosita go to find the base of the Cybermen and find children working in a steam engine having been brought there as slave labor by Miss Hartigan, the Cybermen's human ally. The Cybermen update their info with a stamp and identify the Doctor as their enemy but Jackson appears with more stamps and distracts the Cybermen allowing all to escape. The Cybermen then turn on Miss Hartigan and convert her into the controller of the Cyberking, a gigantic robot powered by the steam engines the children are working on. Eventually the Doctor, Rosita, and Jackson find the second entrance to the Cybermen base and rescue the children including Jackson's son whose kidnapping cause his mental state to begin with. The Doctor then uses the gas balloon to speak with the converted Hartigan and offered to take them to a new planet. When they refuse he uses the infostamps to sever her connection with the Cyberking. Her raw emotion of seeing what has become to her overloads the cybermen and cyberking causing them to malfunction. Using some tech, the Doctor sends them off into the Time Vortex and saves London. The episode concludes as Jackson convinces the Doctor to stay for Christmas Dinner in honor of those whom they lost over the years. *sigh* This one tried, bless it's heart... it honestly tried. There's some really really good ideas inside this story. The Doctor meeting up with a future version of himself with extreme amnesia? That's a good idea. A man truthfully believing himself to be the Doctor when he isn't? That's a neat idea to explore. Figuring out how the Cybermen would survive in a time without adequate technology to keep them running properly? That's brilliant. However his whole thing just sort of fell a little flat between the corniness of things like having Jackson's son be abducted when the rest of us could see it from a mile away just sort of made it... just ok. Let's not forget the insane science of the Cyberking not really adding up. And what's the deal with the Cybershade? Aren't they supposed to be converted cats and stuff? Why are they that big and that ridiculous looking? I... I don't know. It's not terrible it's just not that good. After a thrill-seeking burglar, Lady Christina de Souza, steals a golden chalice from the London museum, she avoids the police by hopping on a bus. The Doctor, trying to track down a strange wormhole on the planet joins her as the police spot her on the bus. However, before they can stop the bus, the bus travels through the wormhole and disappears, reappearing on a desert planet. The Doctor theorizes that the metal exterior of the bus is the only thing that protected. The bus driver doesn't listen and walks back through the wormhole only to appear as a skeleton on the other side. The police call UNIT who send Captain Magambo and scientist Malcolm Taylor to the scene. The Doctor contacts Malcom and get him to work analyzing the wormhole from that side. After meeting with the passengers including a low level psychic, The Doctor and Christina scout out the planet while the others attempt to repair the bus. The pair notice a large sandstorm on the horizon but are captured by two fly-like aliens and taken to their ship. It is revealed there that the planet used to be a thriving planet with billions of lifeforms but it suddenly became a barren dessert. The Doctor convinces them to send out a probe into the storm where they discover it is actually a group of metal-skinned sting ray creatures who eat everything on an entire planet then circle the planet with such speed it rips a wormhole open to their next destination, which of course will be Earth. In order to get them back to Earth they will need the crystal and clamps from the alien ship which Christina obtains. However, her body heat caused a coupe of the sting rays to awaken on the ship and eat the fly aliens. The Doctor and Christina rush back to the bus and attach the anti-gravity clamps to it with the help of the golden chalice Christina had stolen. They emerge back on Earth just in time as Malcolm had refused to close it sooner even at gunpoint from his superior. Malcolm closes the wormhole and UNIT takes out the three sting rays that came through. Christina begs to be his companion but the Doctor refuses as he doesn't want to lose any more companions; she is arrested for theft by the police. The psychic, Carmen then tells the Doctor that his song is ending and that... he will knock four times. As a last act of kindness, the Doctor uses his sonic to undo Christina's handcuffs allowing her to climb aboard the flying bus and escape. This was a pretty solid episode with a nice sense of danger. It also served as what should have been the perfect companion origin story. Christina would have made for a fantastic companion and it's a real shame that she wasn't given the opportunity as the pair worked wonderfully together and, with the exception of Malcolm, stole the show. 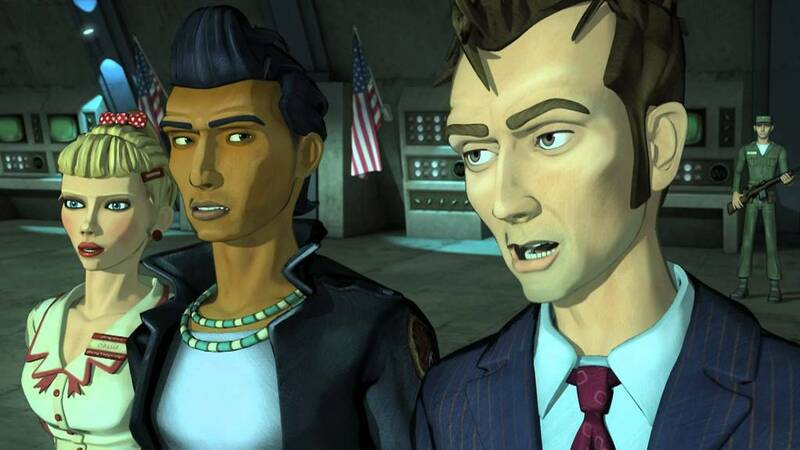 This type of character was such a good idea that had the classic series continued another season, a character just like this would have been the companion. Oh well, at least we have a good solid performance from a pretty decent episode. The Doctor lands on Marsh in 2059 where he comes across the first human settlement on the planet. Quickly he is detained by the crew lead by Adelaide Brooke. The Doctor learns the date and remembers that it is on this day that the base is destroyed by a nuclear blast and it's destruction cause humanity to reach out for the stars to meet other life forms. It's a fixed point in time and he really cannot interfere with what is about to happen. However he becomes involved without his will when Adelaide suddenly can't communicate with two of her crew memers. The two members have become infected by a water-based virus and begin spewing large amounts of water from their body while becoming zombie-like. The virus takes over their whole bodies and tries to infect others, successfully infecting one. The Doctor and Adelaide quarantine the infected crew member and by observation learn it is an intelligent virus known as The Flood and it desires to go to Earth so it can spread to all beings there. The Doctor and Adelaide examine the source of the base's water, a glacier on the surface, and the Doctor theorizes that it was trapped there by the Ice Warriors at some point only to be awoken by the base and a faulty filter. Adelaide orders for the ship to be abandoned at once so the Flood cannot infect anyone else and asks the Doctor what he knows. Reluctantly, the Doctor tells her their fate and why it is important and fixed. She agrees to let him leave. The Flood however has started attacking everyone it can from all directions infecting most of the other crew members, including the pilot who detonates the rocket so the Flood cannot leave Mars. With only Adelaide and two others remaining, she starts the site detonation. However, the Doctor hears their screams and cries and decides to return to the base to save them. He sends a robot out to bring the TARDIS to them and evacuates the three of them back to Earth before the station explodes. Adelaide asks why he interfered and he explains that he is the last Time Lord Victorious. He is going to do whatever he wishes because he's earned that right. She disagrees, goes into her house and commits suicide. The Doctor then sees that is is her death that ensured the future. The Doctor sees a vision of the Ood Leader and realizes he's gone too far, however he refuses to die just yet and flies off in the TARDIS. This next sentence is weird but it'll make sense eventually. This story makes me think a lot of Harry Potter and the Half-Blood Prince. The first time I read that book I focused on the wrong thing...all the high school drama and kissing. I didn't really like the book until I got to the end and realized what I should have been focusing on. The second time I read it, I focused on the right things and it was an amazing book. That's basically the same thing here. The first time, I focused entirely on the Flood, the weird makeup, and the annoying robot so I thought this episode was terrible. However a second viewing showed me the tragedy of the Doctor not being able to help someone in a fixed point in time, and the consequences of attempting to do so. Although the whole reason behind Adelaide killing herself was a little...weird and rushed... it still made an impact. Overall this is a fairly decent story. 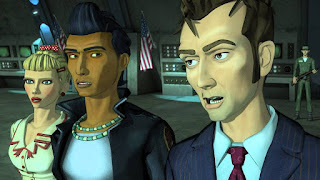 The Doctor lands in New Mexico 1958 where he enters a diner and activates some alien tech that the waitress Cassie had been holding on to since the 1947 alien crash landing in Roswell. The pair along with Native American Jimmy investigate Jimmy's claim of a space monster. The monster turns out to be an insectoid alien known as a Viperox. However, the US Military destroy the alien and take the three of them into custody at Area 51 (or as the Doctor calls it, Dreamland.) While there Colonel Stark attempts to wipe their minds with gas but the Doctor breaks free and the three escape to find a female gray alien in custody while Colonel Stark is revealed to be working with the Viperox leader, Lord Azlok. The trio escape using the gray alien's ship and crash near the town of Solitude which turns out to be the egg laying grounds of the Viperox Queen. The trio escape to find Jimmy's grandfather, Night Eagle who takes them to a cave where a male gray alien is being kept. The alien explains that their people lost a war against the Viperox and the alien tech Cassie found is actually a genetic weapon to wipe them all out. However, Colonel Stark appears in the tunnel and takes the alien hostage as well as the Doctor, Jimmy, and Cassie. It turns out the male grey alien can modify the DNA code of the weapon and Colonel Stark wants it to wipe out the Russians hence his alliance with the Viperox, but after a conversation with the Doctor, Stark realizes the Viperox will just take over earth despite their alliance and turns on the aliens. Lord Azlok begins hatching the Viperox to attack nearby towns and eventually the Doctor creates a deafening soundwave from the TARDIS causing the Viperox to stop. The Doctor explains that one day the Viperox will become a peaceful race and tell them to leave Earth. For once the villains actually listen and flee the planet with the knowledge that the Doctor has the DNA weapon. The Doctor leaves the weapon with Stark and flies off. First, I would like to point out that they included WAAAAAYYYYYYYY too much material in this special. I left out a whole bunch like the Men in Black looking androids, searching for the cure to revive the male alien, and a bunch of other things. Despite that, look how much I still had to write for 45 minutes of airtime?? Geez. This one is... weird. That's the best way to describe it...weird. It's animated and it kind of runs on animation logic of people just sort of showing up because it's convenient for the plot to move forward. It's not terrible by any means it's just got far too much content, it jumps around too much, and it's really really weird. The Doctor returns to the Oodsphere where he learns through the Ood that his nemesis, the Master is going to return soon. On earth, a cult loyal the Master attempt to revive him but his ex-wife Lucy Saxon sabotages the ritual causing the Master to return in an ever hungry and non-stable state. The Doctor returns to Earth in search of the Master but finds Wilfred Mott instead before hearing an oil drum be beaten four times. 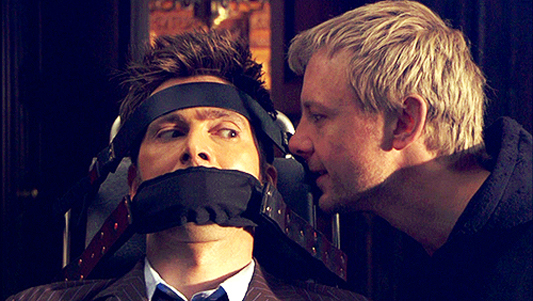 The Doctor tracks the Master down to some wastelands where he discovers the drumming sound that the Master mentioned in his previous encounter is actually real; someone had placed that ever-present sound in his head. Before he can learn more, the Master is abducted by troops and taken in custody to the home of billionaire Joshua Naismith who is in possession of an alien "Immortality Gate" and wishes to employ the Master to fix it and provide eternal life for Naismith's daughter. The Doctor meets back up with Wilfred and explains the prophesy of his death being preceded by someone knocking four times. After getting a spectral visit from a woman asking Wilfred to arm himself before joining the Doctor, Wilfred gets his gun and goes with the Doctor to the Naismith estate. There, they learn from two undercover aliens that the device is actually just a medical unit from their homeworld, but the Master has been hard at work turning it into a DNA modifier. He quickly jumps into the machine and transforms every human being on the planet into an exact replica of himself with the exception of Wilfred who was shielded at the time, and Donna who was still part Time Lord despite having no knowledge of this. It is then that the narrator of the episode is revealed to be the Time Lord Preseident and he announced that this was the day that the Time Lords returned. The Doctor and Wilfred are rescued by the undercover aliens and taken to their orbiting spaceship outside of the Masters reach for them to think. Meanwhile on Gallifrey during the last day of the Time War when Gallifrey was set to be destroyed, the President refuses to let Gallifrey fall and has Time Lords go back and place a drumming sound into the mind of the young Master so that when he duplicates himself a billion times on Earth, the signal can very slightly breach through the Time Lock that Gallifrey is under as the Master would have existed inside and outside the time lock. Using this window of opportunity, the Time Lord President sends a dwarf star through the tiny signal hole to make the connection more permanent. The Master finds this dwarf star and builds a machine to bring Gallifrey back. Gallifrey begins to re-materialize beside Earth, but the Doctor realizes that the other horrors of the Time War will be released with it. He grabs Wilfred's gun, pilots the ship to the Naismith house and crashed through the roof as the Time Lord Council appear. The Master boasts of his accomplishment but the President removes the DNA duplication from the humans. The Doctor deliberates on whether he should shoot the President or the Master in order to stop this from happening but he sees a familiar face, the woman who appeared to Wilfred, motion towards the dwarf star. The Doctor shoots the dwarf star causing Gallifrey to disappear back into the Time War. The President tries to take the Doctor's life for this as he fades, the but Master stands in the way and fights the President as revenge for planting the drumming in his head. The Time Lords, Gallifrey, and the Master all disappear. As the Doctor realizes his victory, he hears four knocks. 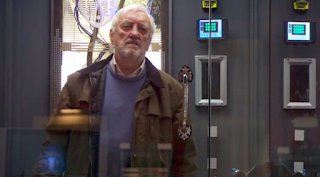 Wilfred Mott had returned to the mansion to help and had gotten trapped inside the radiation chamber which was about to unleash toxic levels of radiation on whoever was inside. The Doctor sacrifices himself to save Wilfred and is blasted with radiation. He survives but his healing wounds mean that his regeneration has started. He returns Wilfred home and proceeds to see all his past companions one more time before hopping into his TARDIS and regenerating. This two-parter was fairly ok. There were a lot of things that honestly didn't make much sense in the overall scheme like why they needed a reason for the Master to return and a manner in which he could when he always just sort of showed up in the past. Not to mention all the junk about exactly how Gallifrey came out of the Time Lock... it just kind of doesn't make much sense. It was an OK two-parter but it had some really fantastic individual moments. 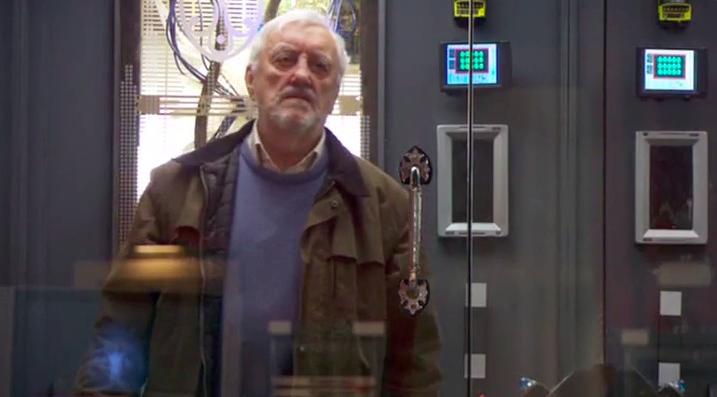 Wilfred Mott grouping the old people together to find the Doctor was hilarious. Wilfred and the Doctor's conversation about how everyone, even the dead, were transformed into the Master was fairly chilling. Actually basically every single thing involving Wilfred was funny, great, or made you cry. Wilfred treated the Doctor like a son. He begged him to take his gun because he didn't want him to die. He was willing to take the full force of the radiation because he was old and had lived his life. His tearful final goodbye to the Doctor makes me cry EVERY single time I watch the episode. Bernard Cribbins is a treasure and he brightens every scene he's in tenfold. While the lead-up to his eventual regeneration did seem like it took awhile, it was nice to see Martha, Mickey, Sarah Jane, and Rose one final time. A pretty decent episode with some glorious moments. And honestly that shouldn't be the case. David Tennant was an extraordinary Doctor. There's a reason he's still considered the most popular of the modern Doctors. Many still consider him their favorite doctor. He's truthfully that good. He went out well and heartfelt, I could have just done without the hammering it in. Please join me again as we continue to examine all of Doctor Who.